Even in death, life rarely goes as planned. Follow these new characters in the Five Roads to Texas series as they set sail on a harrowing journey to what might be the last bastion of hope in America. We didn’t see or hear from the other characters from the series in this book. It definitely stands alone. Great story of commitment and survival in a zombie future. Wish I could remember if Malcolm’s family are mentioned in any of the other books. I’m sure everyone will come together at some point so I will start book 5 now. Then on to Sidney’s story and I am really looking forward to that one. She been my favorite character so far. Andrew is, as always a top notch excellent narrator. One of my favorites! I really enjoyed book 4. This added to the series and then tied into other characters. I loved that this story line started in my area and spoke about many cities and landmarks that I know. Narration was great! Story was great! I received this for free for an honest review. I always love visiting our friends in this series! Malcom ends up with a pre made family to care for while he struggles with losing his own as well as fighting the afflicted. Andrew B Wehrlen was ,again a fine narrator. it was a good story and I enjoyed listening to it. the only thing is that already have listened to the others in the series, it is kind of a spoiler knowing that the people trying to make it to El Paso will be disappointed when they arrive. also, being met by the female sergeant who was killed in the last book is kind of a downer. This installment reminds me of the early Walking Dead years. People struggle, survive and die, but the story goes on. Great series with great narration! 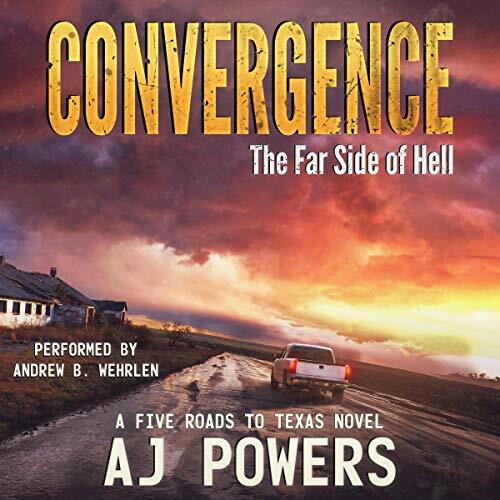 Convergence: The Far Side of Hell: A Five Roads to Texas Novel, Book 4. The Five Roads series is without doubt the best post apoc series in recent years, this one is awesome. Our protagonist Malcom has suffered enough guilt and pain. He leaves his empty home one last time seeking revenge for the loss of his wife and children to the infected. Elsewhere, mother and successful surgeon Tessa along with her children, pack their bags to leave the city of Cincinnati and avoid the infected. Paths cross, and we follow the survivors as they struggle cross-country to reach rumored safety in El Paso. Good story, great characters. This audiobook was given by the author, narrator, or publisher at no cost in exchange for an unbiased review via Audiobook Boom. This story is another great addition to the series. Of course Andrew Wehrlen as narrator has brought these stories to life. Can't wait to hear the next release.